On April 30, 1842, John P. Squire and Francis Russell formed the partnership of Russell & Squire in the City of Boston. This original firm, which was located at No. 25, Faneuil Hall Market, was involved primarily in the business of provisions (Gilman, 1896). While the partnership functioned successfully for five years, Squire was ultimately given sole control of the company in 1847. Squire continued to operate the Faneuil Hall Market business alone until 1850, at which time he entered into a new partnership with Hiland Lockwood, husband to Squire’s sister, and Edward D. Kimball. The new firm name was given the name John P. Squire & Company (Gilman, 1895; Stone, 1930; Eliot, 1913). 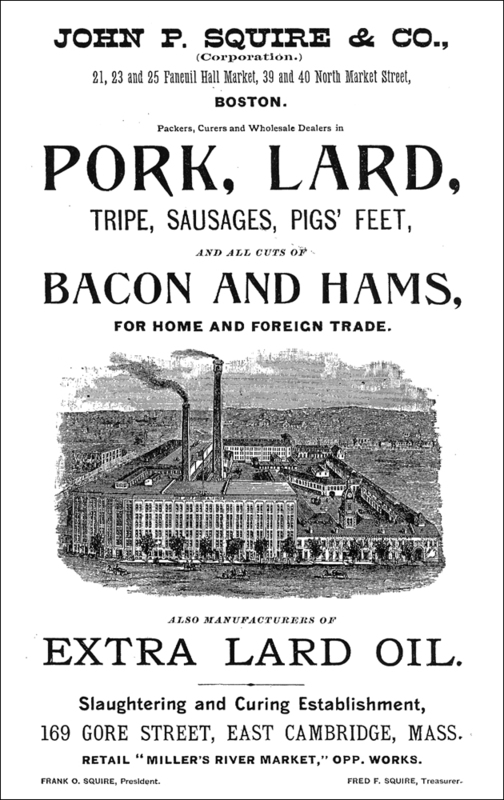 With the formation of this partnership, Squire sought to expand the business to include the killing and dressing of hogs for the Boston market. By 1855, he had purchased a tract of land along Miller’s River in East Cambridge and constructed a small slaughterhouse. Squire selected the site primarily on account of its proximity and access to the river, which allowed for easy disposal of waste (Eliot, 1913). Within the first year, the company did $16,000 in business and killed approximately one hog a day (Gilman, 1896). Beginning in 1866, the original partnership between Lockwood, Kimball, and Squire went through several changes and by 1884, the company partnership consisted of John P. Squire and his two sons, Frank O. Squire and Fred F. Squire. In 1892, the company was incorporated as the John P. Squire & Company Corporation, with John P. Squire serving as president, Frank O. Squire serving as vice-president, and Fred F. Squire serving a treasurer (Gilman, 1896; Stone, 1930). Throughout the late nineteenth century, the business continued to experience substantial growth. In order to meet demand, Squire found it necessary to also slaughter hogs in the summer months. This was a particularly challenging task because the slaughtering and curing process required the temperature to be kept at approximately thirty-eight degrees. In response, Squire constructed in 1881 a large refrigerator building that held approximately 30,000 tons of ice. Squire routinely hired hundreds of additional men in the winter months for the sole purpose of harvesting ice for the summer months. In 1891, the Squire factory was partially destroyed by fire and soon rebuilt with a modern system of artificial refrigeration (Eliot, 1913). To the new factory complex, Squire added eight boilers, two refrigeration machines, and a 230-foot chimney (Cambridge Chronicle, 1892). These improvements significantly expanded the capacity of the factory, allowing for the refrigeration of over 12,000 hogs at a time (Stone, 1930; Gilman, 1896). By the early twentieth century, the company’s production facilities had expanded to cover approximately twenty acres of land along Gore Street. At least seven acres of this land was utilized solely for artificial refrigeration purposes. The plant, which contained hundreds of thousands of feet of floor space, was essentially self-sustaining. It included its own carpentry, machinery, electrical, cooperage, and blacksmith shops; its own plumbers, masons, and mechanics for repair work; and its own box mill, which produced over one million feet of lumber monthly (Eliot, 1913). In fact, according to one Cambridge historian, the company kept “a duplicate of every part of every machine used in the plant constantly on hand in case of accident” (Eliot, 1913, pg. 296). The Squire plant was capable of killing over 6,000 hogs a day, many of which were shipped from the Midwest via the Mississippi River (Eliot, 1913). At its height, Squire employed over 1,500 workers – including one woman and fifteen girls – and maintained branch factories across the State of Massachusetts (Stone, 1930). By the mid-1930s, J. P. Squire was acquired by Swift, a Chicago-based meatpacking company. Swift originally appeared in Cambridge in 1915 after purchasing from Squire a tract of land on Gore Street for the construction of an oleomargarine factory. Swift continued to operate the Squire company – which was then considered the oldest meatpacker in the United States – until the 1950s. The abandoned factory complex was eventually destroyed by fire in 1963 (Maycock, 1988; Stone, 1930).